I have just got home from a workshop held at my local library about haiku, led by local poet Bethany Rivers. The session was called Shine Your Light, linking in to the theme of light which was chosen for this year’s National Poetry Day, which was on October 8th 2015 (last Thursday). In Sunday’s One Million Words update, I said I wanted to take part in rejuvenating activities this week, and this haiku workshop was definitely rejuvenating. Nobody mentioned the 5-7-5 syllable pattern, which turned out to be the sort of answer that would have set off the klaxon in QI; apparently it doesn’t translate. In Japanese, it is 5-7-5 sounds, and a sound isn’t the same thing as a syllable – one syllable might be two or more sounds, apparently. So we were told to forget counting syllables, and just to keep things short – under about 15 words was our stated guideline – and attempt to paint a moment in words. Over the course of the workshop we examined some published haiku and picked out what makes a haiku. So I have learned that haiku often have a seasonal element or are about some aspect of nature, but don’t have to be. They do not contain many adjectives, but do contain objects, tangible objects – trees, leaves, spiderwebs, wheelie bins, to name a few of those in the example haikus. And they all have at least one verb, some sort of action, even if that action is small. Also, punctuation tends to be a no, except a dash sometimes, and capitalisation is also not used. The theme of light comes through in these three things, and the need for an object in the haiku. The task was simply to note something down, but it seemed like others were writing haiku about these things and I had finished noting them down quickly, so I had a quick first attempt at haiku (this, I should note, after we were told not to count syllables, but before the stuff about adjectives, nouns and verbs). Scales in kitchen – morning light reflecting in the metal dish while I made my coffee. Rosehips in the rose bush in [my fiance’s mum’s] front garden. The Christmas lights on the back of my armchair in my study, giving a nice glow to the room. 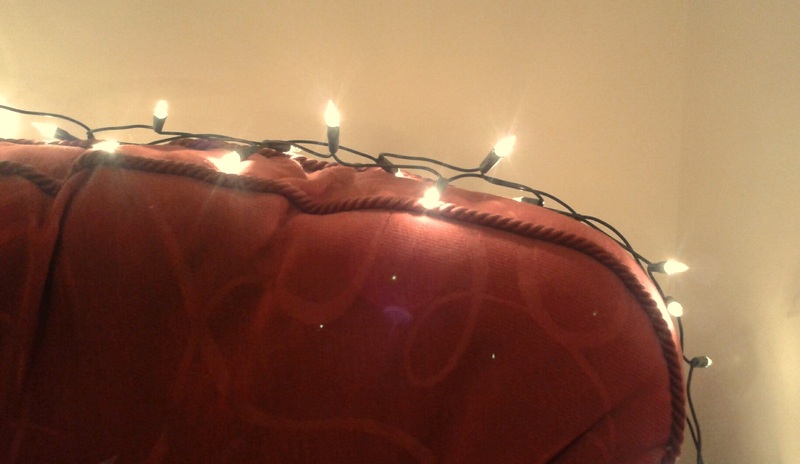 The Christmas/fairy lights in my study, draped over the back of my armchair. Everyone read out something they’d written – some were haiku, some were just notes, and one was a rhyming couplet. The next exercise was to look at some published haiku. There were four of them, and for each one, Bethany asked three different people to read it out loud in turn, before we discussed it. Part of the reason for this was three readings gave us some time to think about what’s being said, and part was because different readers give different intonations and inflections, which could prompt different interpretations in your mind. After each triple-reading, we discussed the haiku – what we liked about it, what we noticed about them, and so on. As one of the other attendees noted, this haiku goes from the large – the grey skies – to the minute – the thin spider web, as if zooming in from a wide focus to a very detailed one. And then there’s the contrast between movement and stillness – the leaf is spinning, but it is caught in the web, so it isn’t falling, it’s just hanging in the air. Contrast and similarities was a theme that came through in the haiku we read, and indeed is apparently a feature of many haiku. Not one of the haiku we looked at had the 5-7-5 syllable structure that is often attributed to haiku. Armed with new knowledge and understanding of the form, we moved on to our next exercise. We were each given a sheet of paper with a table on, with columns labelled Object, Action, Location, Sound, Light, Feeling. Three rows had been filled in already (with the Feeling column left blank), with three example haiku at the bottom of the page containing the elements in the rows. Our task was then to go back to our notes and ideas from the first exercise and fill in each column with the elements, and then write new haiku based on these. We had quite a lot of time for this, and now were armed with the knowledge about what haiku tended to have, and how short the examples were, and the bits about adjectives, nouns and verbs. I felt like this final exercise was very much more about editing (though some others in the group had different approaches) – about cutting and paring down to the bare essentials. It proved quite challenging but also enjoyable. The workshop has given me some insight into a poetic form I was previously fairly ignorant of, and which I have discovered I rather like. I may well write some more haiku in the future. I greatly enjoyed the process to writing these. For my writing in general, I think practicing haiku will help me be more concise and precise. I know I’m verbose in prose, but it’s clear from this workshop that it is entirely possible for me to create a vivid picture or impression with minimal words, if only I can pick them better. This may well slow my progress for the One Million Words challenge, but, I hope and expect, will mean that one millionth word will be rather better than it might have been without it.